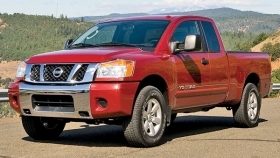 Some 2010 Nissan Titans would be part of the expected recall. NASHVILLE -- Nissan North America expects to recall 48,700 U.S.-built light trucks next week to fix a suspension part that may not have been welded properly. The recall, which was still under discussion with the National Highway Traffic Safety Administration late Friday afternoon, would involve some but not all 2010 Nissan Armadas, Frontiers, Titans, Pathfinders and Xterras and Infiniti QX56 models, said Nissan spokesman Colin Price. The problem concerns a lower suspension control link that might not have been welded correctly, Price said. Under some conditions, a bushing collar could crack as a result. Nissan does not know of any accidents as a result of the problem.